I notice that Ikea sell their wireless chargers without a shell for insertion into desks. The "desk" I chose is a curve cut profile in mahogany that just happens to have the same fit as an LG G3/4/5 type phone. The design changed along the way to a more upright one which then required a catch to stop the phone sliding off. This was done in Fusion360 which allows bringing in STL files of things like phones and cutting those out of another body. It took a while to work out the ball end toolpath but I finally worked out how to get something that worked reasonably well. 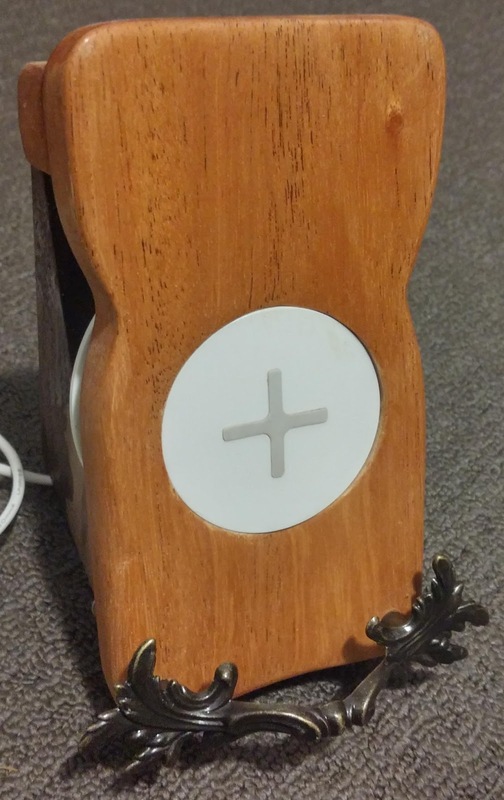 The chomps in the side allow fingers to securely lift the phone off the charger. It will be interesting to play with sliced objects in wood. Layering 3D cuts to build up objects that are 10cm (or about 4 layers) tall.